With just over two months left under the ECB's sovereign bond buying program (unless, of course, Mario Draghi reverses should European stocks continue to plunge), Italy - which has been the biggest beneficiary of ECB's QE generosity, keeping Italian bond yields low, is starting to sweat: after all, without the ECB backstop and with Italy now in a critical stand off with the EU which will likely get much worse before it gets better, why would anyone buy BTPs? So, as a bizarre alternative, Italy's La Stampa reported this morning that Italy Deputy Prime Minister and head of League party Matteo Salvini requested that Premier Giuseppe Conte discuss possible Russian purchases of Italy govt bonds at his meeting with President Vladimir Putin on Tuesday in Moscow. According to the Italian newspaper, "Salvini would favor Russia buying Italy govt bonds once there is no shield from ECB." It was not clear why or how, or under what mandate Russia would backstop Italy, or how the ECB would view such an action from the Kremlin, or whether Russia funding the Italian deficit is even permitted by Article 123 of the Lisbon Treaty, but we doubt the proposal was meant to be taken seriously, and if anything we merely a "trial balloon' by Salvini to show what may happen if and when Italy leaves the monetary union. In terms of what actually is on the agenda, Conte is expected to discuss with Putin EU sanctions on Russia over Crimea annexation and may ask Putin to attend conference on Libya that Italy will hold in Palermo Nov. 12-13. 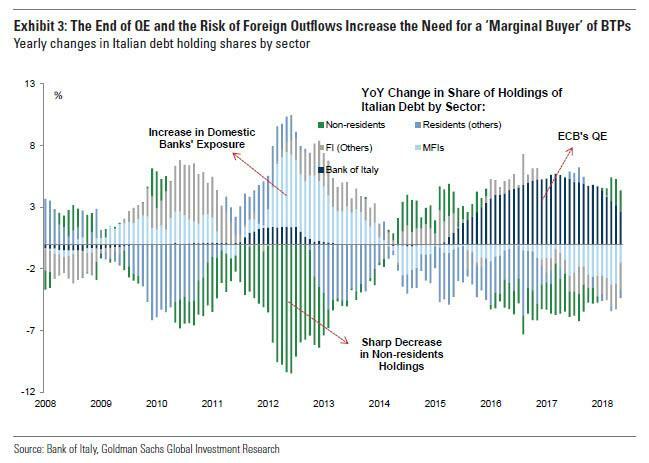 Separately, and in a somewhat related story, Italian bonds initially advanced on Tuesday after La Stampa also reported that the government hopes that the ECB would purchase the nation’s debt if the bond yield spread with German Bunds got out of control in the coming months. Following the bizarre report, which we assume is premise on a continuation of QE only for the benefit of Italy, something neither the ECB nor Germany would ever agree to, the Italian 10y spread to Germany tightened 2bps to 302bps, and the FTSE MIB outperformed European index peers. 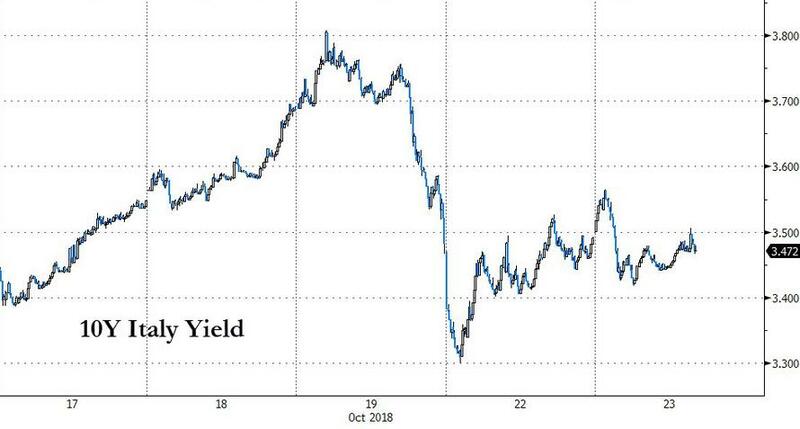 However, the outperformance was not meant to last, and Italian bonds reverse gains after PM Conte denied moments ago that he has a "Plan B" - something speculated earlier in the day - to the nation’s budget in an interview with Bloomberg Television, prompting a safety bid in EGBs. Italy's FTSE MIB stock market also extends its drop, down 0.7% as of 2:35pm CET, after Conte's "Plan B” denial. And now all eyes turn to Brussels (if not the Kremlin just yet), as the EU may implement the "never-before-used" step of demanding revisions to the budget as soon as today.